There is a lot of money still to be raised to be able to start the project. We are very grateful to all of you who have pledged money so far and we hope many more pledges will be made as we progress. We are thinking about fundraising events and organisations we might approach. Watch this space for further details. If you have experience of fundraising or would like to help or just find out more please get in touch. Tickets on the door £9.50. Come and enjoy an afternoon of Christmas music performed by local Swanage favourites. 20 Pences Around The Bandstand raises £2,400! Despite a grey and somewhat drizzly day the event raised £2,400. The Mayor Mike Bonfield laid the first 20p followed by the deputy Gail Green and the first circuit was completed by young Daisy putting her collection of coins in place. That was just the start and 5 circuits were completed with a 6th started raising a total of £1200. Thank you to everyone who has been collecting for the event. On the day we were entertained by Karen Grant until the weather stopped the use of equipment. Thanks Karen. Your support is much appreciated. We also had another table top sale, there were donation buckets and the results of the raffle was announced late in the afternoon. Thank you to everyone who donated prizes for the raffle and items for the table top sale. This was another event that demonstrated the support from the people of Swanage to get our bandstand back. The total from the day was £2400. Fantastic. Renowned local artist Roy Aplin painted a special work of art which he donated to be sold to raise funds for Swanage Bandstand. 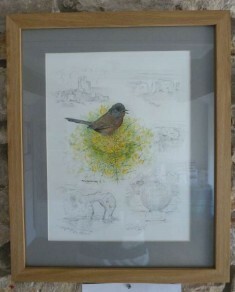 Roy's painting raised £400. Many thanks to Roy for producing this lovely painting and donating to the cause. Roy's paintings can be viewed on his own website. Terry Wogan Blazer raises £300! 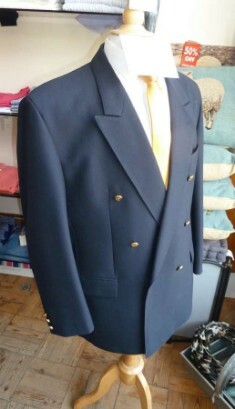 The fabulous Terry Wogan blazer which was very kindly donated to FOSB raised £300. Thank you very much to the donor and we hope the new owner gets great pleasure wearing it. Starting under the hot summer sun was a performance by the Warington Concert Band who had been touring the UK. Oh how we could have done with that new roof! Despite that they put on a wonderful programme of music. The Warrington Concert Band were then followed by the Phoenix Brass Band who again provided great entertainment for the growing crowd of people. The amphitheatre setting made for excellent viewing of the performances. FOSB would like to extend their gratitude to both bands for coming and playing at Swanage and supporting the fundraising effort. Next time we see them lets hope its in a restored bandstand. Fittingly on the last day of Purbeck Arts Weeks today, the draw took place at Purbeck New Wave Gallery, 21, Commercial Road, where Alan Houghton picked out the winning ticket from a drum and Gina Marshall presented her original iconic framed painting of Swanage Bandstand to Sue Taylor of Swanage who had the winning raffle ticket. We would like to give Gina a huge thank you for donating her work and a huge thank you to everyone who bought a raffle ticket. Saturday's table top sale held at the bandstand was a resounding success. The weather was marvellous - almost too good with the effort required to set out the stalls and put away over the 3 days of the sale. The sale raised £1,648 and donations £478. Many thanks to all of you who donated items to the sale, for the loan of the garage to store the goods and for the supply of the tables. Lastly of course tremendous thanks to the volunteers who came along to man the tables over the 3 days. Friends of Swanage Bandstand, would like to thank The Belvedere Singers who had a concert on Saturday 12th May to show their support for the restoration of Swanage Bandstand. We raised in donations the fantastic total of £429 on the night, which is just another positive sign of how much support we have in our aim to restore the Bandstand to as it was. So now we have banked approx £52,700. Well done all of you. Thank you all once again. Alan Houghton. Saturday's concert put on by Karen Grant and support group raised including a raffle a total of £720, of which we had a donation of half (£360). The other half went to Steph Sheperds Planets Charity ( a very worthwhile charity.) It was another great night of entertainment. Thank you Karen,also a big thank you to the rest of the entertainers on the night. Local group the Nutty Knitters have very kindly raised £100 and donated it towards the cause. Well done and thank you for donating these funds towards the restoration. Alan Houghton Chair of FOSB was presented with a cheque for £300 at the British Legion in Swanage. Thank you very much to Herston Young Wives for raising and donating these funds towards the restoration. Swanage Boxing Day Swim (Brrrr) Donates £1,400! Swanage held its annual Boxing Day Swim organised by Julian Wood of Country Foods Catering. FOSB would like to thank Julian and all the people who went in to very cold water and helped to raise more funds for the Bandstand, the sum received was £1400, a fantastic donation. Alan Houghton Chair of FOSB. 'Bless you all for your continued support, and of course we still need more, bringing us even nearer to restoration. The total now banked is £32,600 with about £14,000 still to be collected plus councils £50,000 help us keep up the momentum, and don't forget the raffle'. Emmanuel Baptist Church Swanage very generously donated half the money raised from the Christmas tree festival, £555 came to FOSB. Thank you also to everyone who supported the Festival and contributed towards the donation. Evening of Musical Entertainment raises £555! Last night we had a fantastic concert put on for F.O.S.B.by the very talented Karen Grant. 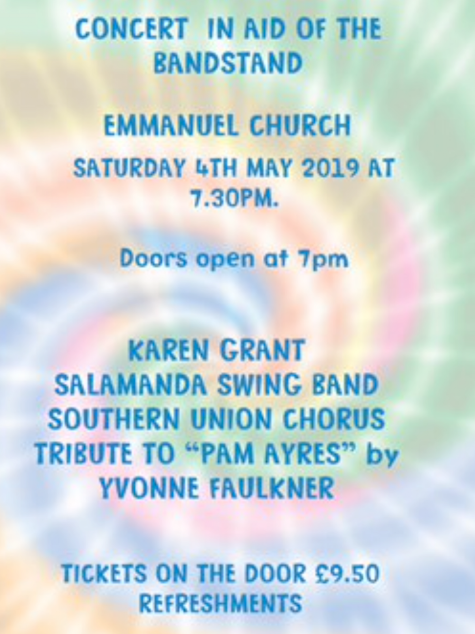 Also supporting her was the Harmony Rocks Choir, Mind The Gap Acapella Singers, A tribute to the poet Pam Ayres, and then the young talented Keyboard player Karl Lattimer. The sum raised was a fantastic £555. The concert was attended by the Mayor Mike Bonfield, and it was sold out. Thank you Karen, and all who also gave their time. F.O.S.B would also like to thank Sue Spinney who made Sunflowers and cards placed in Nationwide Swanage. Donations came to £190 Thank you Sue. Thank you also to everyone who came along and supported this event. 21st October 2017 at 7pm.